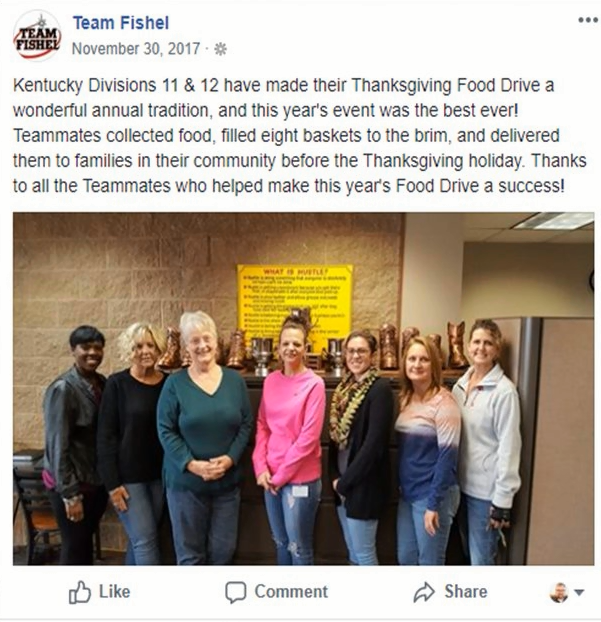 Social recruiting is the activity of leveraging social media platforms to advertise job openings, recruit candidates, and communicate company culture. With 70% of Americans utilize at least one social media site, there is no denying that companies should be leveraging social media to search for talent. The majority of talent professionals already do leverage social media: According to the most recent SHRM study on social recruitment, 82% of talent acquisition professionals are using social media to recruit passive candidates. In order to attract top talent recruiting professionals need to develop a winning social recruiting strategy. 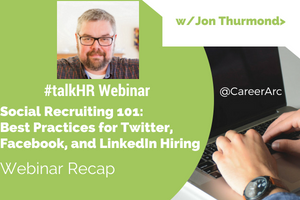 This is probably why so many HR leaders and TA professionals tuned into one of our most popular webinar series to date:“Social Recruiting 101: The Must-Know Tactics & Strategies for LinkedIn, Facebook, & Twitter Hiring,” this time hosted by Jon Thurmond, the Mid-Atlantic Regional Human Resources Manager for Team Fishel, who covered the fundamentals of building a social media presence that targets the right job seekers reinforces positive employer brand awareness and positioning. To help recap the webinar we’ve highlighted the top shared #talkhr tweets from the event. Webinar Poll: How Are You Using Social Media to Recruit? Jon kicked off the webinar by launching a poll asking attendees how they are currently using social media in their recruiting strategy. While nearly 29% of attendees said they have a strategy set across the board, over 60% of attendees have dipped their toes into social media recruiting by posting some jobs but do not currently have a social recruiting strategy in place. A mere 8% of attendees do not currently use social media in their recruiting strategy. Why is social media important to your recruiting strategy? How can you leverage Twitter, Facebook, and LinkedIn in your recruiting strategy? What should you include in your social recruiting content? Jon answered these question by diving into the three main social platforms used for hiring today—Twitter, Facebook, and LinkedIn—and covered recommended methods, examples, and optimal times to post for each platform. Adding a social media component to your recruitment strategy will help with candidate engagement, it will help you gain market intelligence, and will help with your brand development. 79% of job seekers are already using social media in their job search so if your company is not posting jobs on these social sites, you are missing out on potential passive and active job seekers. Michelle Foster (@mfosterHR) tweets one of the most powerful stats from the webinar, 11% of candidates would turn down a job from a company with a bad social reputation, even if they’re currently unemployed. The impression you make on job seekers will determine the likelihood of them applying to your jobs so it’s important to think strategically about the content you’re posting. Twitter, Facebook, and LinkedIn are the top social networks being used among adults. Take advantage of the full potential these social networks offer your recruiting goals. You can increase engagement by adding images and video to your social posts. As Layla Bonis (@HRinspired) mentions (and exemplifies in her tweet above), tweets with images receive 18% more clicks than those without. Images aren’t only useful for Twitter; they help boost visibility on Facebook and LinkedIn as well. LinkedIn posts with images receive 98% more comments. Facebook receives 53% more likes than the average post. Videos have become even more engaging than images on social media. There are 100 million hours spent watching videos on Facebook daily. Videos retain 37% of viewers, so as Jon notes, it’s important for your message to be communicated throughout the video in order to keep viewers engaged. Determining what to post on social media can be difficult. Keith Enochs (@KeithCEnochs) captured a great image of the 4 C’s to consider when you post to social media. Content Quality: Content that is worth reading to candidates. Credibility: Trustworthy content for the candidate. Conversation: Engage with candidates; answer their questions. Consistency: Post often and have consistent content messaging. As Jon mentions, when posting on social media remember your messages should be clear, concise, accurate, and drive candidates to apply for your positions. How Can Recruiters Leverage Social Media to find Candidates? Social recruiting doesn’t have to be limited to a company’s brand. Employees can also recruit candidates on social media using their personal social accounts. As Chelsi Molina (@ChelsiMolina) mentions, you can build your own personal recruiting brand using Jon’s social recruiting techniques and become a brand ambassador. According to the most recent Edelman Trust Barometer, employees are ranked as one of the most trusted authorities on a range of topics in an organization. Your candidates may learn about your employment brand and opportunities through your corporate account, but then opt to engage with an individual–your recruiter, hiring manager, or even your employee–to inquire about an opportunity. Creating and curating content is one of the most discussed topics among teams. Collaborating on content ideation and production could help align the teams involved in a social recruiting effort (recruiting teams, HR teams, and even marketing teams) and also make the process of sourcing, editing and approving content more efficient. Does your marketing team have approved images you can pull from? Rather than reinvent the wheel, work with your teams and their existing resources to curate the content that aligns with your employer message. Want to take your strategy to the next level? Learn 3 Ways to Turn Your Happy Employees Into Powerful Brand Advocates on Social Media. Download the webinar on demand now. 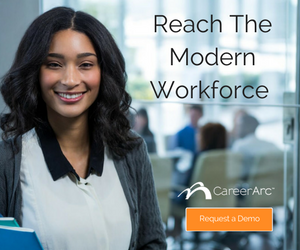 Learn how to develop a winning social recruiting strategy that targets the right job seekers and reinforces positive employer brand awareness.